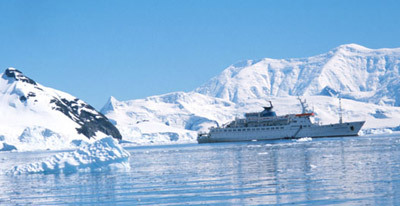 The Maria Yermolova, our Russian vessel, in Paradise Bay, Antarctica January 2001. The Southern Ocean (defined as the area south of the Antarctic Convergence) is one of the most productive areas on Earth – but only during the Antarctic summer (a couple of months around December each year). During these few months there are sufficient nutrients (fertilizers such as N, P, and K) in the surface ocean waters to support tremendous blooms of marine plants. The nearly constant sunlight (sunset can be at 11:30pm and sunrise at 3:30am along the Antarctic Peninsula) during summer creates perfect conditions for the microscopic marine plants (phytoplankton) to multiply in vast quantities. Needing only nutrients and sunlight in the ocean environment, these organisms produce their own food by photosynthesis. These microscopic marine plants are mostly diatoms – a one celled phytoplankter that can asexually reproduce and double its population numbers every few hours in the right conditions. Once the diatom bloom begins there is sufficient food for the next step in the food chain … the magnificent and unbelievably important antarctic krill, Euphausia superba. The third step in this phytoplankton based Antarctic food web is occupied by a variety of krill eaters – penguins, many seals, and baleen whales. The top of the food chain belongs almost exclusively to the killer whale – the most common predator on the large krill eaters (the penguins, seals and baleen whales) but the leopard seal is a main carnivore on penguins and thus may also be a major top predator as well. Krill are small (generally 4 inches or less) animal plankters (zooplankton) that feed on phytoplankton. Given enough food, they can reproduce quickly. Within a few weeks of the diatom bloom, a krill bloom occurs in the Southern Ocean. Massive blooms of krill are called swarms. Thus, the krill function as the second step of the marine food chain (the diatoms being the first step, or base). It is the krill that are most important for the large animals found in Antarctica (birds, some seals, and baleen whales) and is the reason that many of these large animals migrate thousands of miles to Antarctica during the Antarctic summer. Although the Antarctic food web seems rather simple (in comparison with other complex communities) it is highly productive. What it may lack in diversity it makes up in numbers. For example, one blue whale may consume over three tons of antarctic krill in a single feeding so you can just imagine the numbers of krill that are available, during the Antarctic summer to support many large krill eaters. 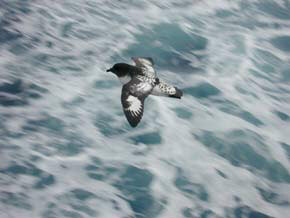 Seabirds (those birds that rely on the ocean for their food) are another important link in the Antarctic food chain. 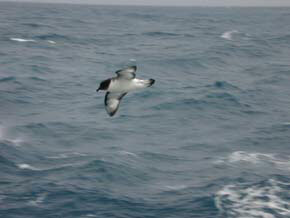 Most of these birds feed on krill but a few of the larger ones take squid and fish. 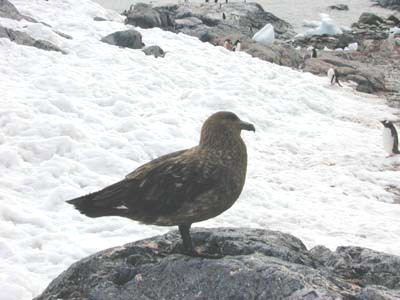 Besides the penguins, the majority of Antarctic seabirds are Charadriformes (skuas, gulls and terns) or Procellariidae (albatrosses and petrals). The Procellariidae are also called the Tubinares (tube noses) because of the tube-like nostrils on top of their bill that have glands that secrete salt. 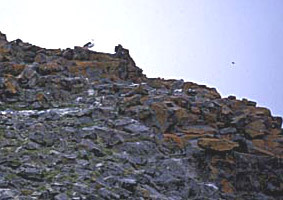 Most of these seabirds nest during the Antarctic summer on seacliffs found on the continent as well as the surrounding islands. They leave during the Antarctic winter when there is little food and the weather is very stormy. Albatrosses are some of the largest birds on Earth (up to a 12 foot wing span) and spend a lot of time at sea. They feed on seafood taken from near the surface of the ocean. The Cape Petal commonly flies in the wake of ships crossing the Drake Passage, feeding on crustaceans and fish churned up by the propeller. All gulls are scavengers, eating anything they can find. These kelp gulls are attracted to the productive Antarctic waters in summer. The only shag (cormorant) to breed on the Antarctic continent is the blue-eyed (or imperial) shag. This is a diving bird, catching its seafood (fish and squid) while swimming underwater. 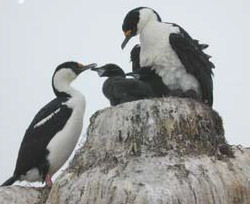 This is a nesting pair of Blue-eyed Shags on the Antarctic Peninsula. The second parent has recently returned to feed the young. Skuas are migratory birds, often travelling all the way from the Arctic to the Antarctic. 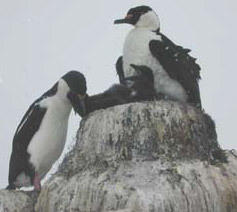 Although they feed on small fish during their migrations, they often nest near penguin rookeries while in Antarctica and feed on neglected penguin eggs and chicks. Most penguins are very territorial and protective of their eggs and young until they are ready to go to sea but occasionally an egg or chick is left alone and the pirate skua is always there. 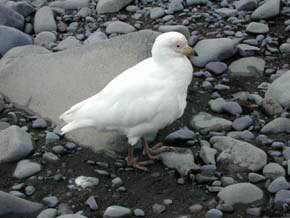 Sheathbills are the only birds in Antarctica that do not have webbed feet. They are scavengers, eating anything they can find along the shore and on land including intertidal limpets and penguin guano. 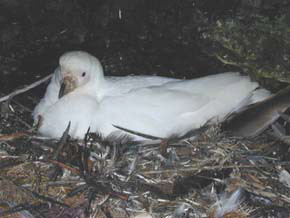 Breeding in separated pairs, this snowy sheathbill has a large nest in a rocky crevice made of a variety of materials thrown up on the beach by the waves. 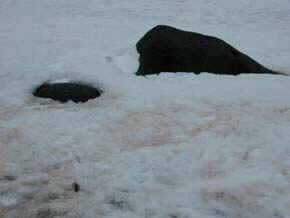 Red snow algae and lichens bring color to Antarctica. An unusually productive area of the coastline of Antarctica with both antarctic grass and antarctic moss. Notice the whale backbone left by whalers years ago. 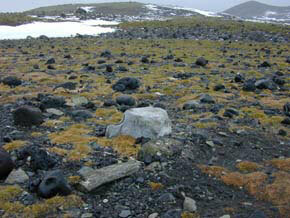 Antarctic grass and antarctic moss are some of the few plants that can survive in Antarctica. They are delicate and must be carefully protected from people trampling them. 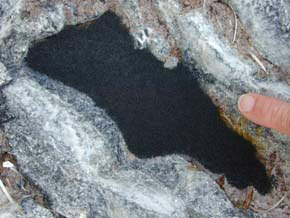 There is a small ecosystem of terrestrial organisms in Antarctica. Although most Antarctic ecology is dominated by the ocean, there are a few organisms that are able to live in the snow or on land. 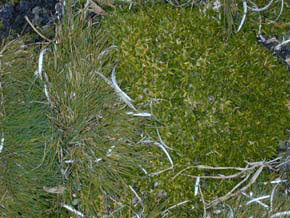 Two types of ice algae stain the snow green and red. In the few rocky areas (many of which are exposed only during the Antarctic summer) there are two species of flowering plants (the tussock grass and a ‘pink’), several mosses, and many lichens. These small patches of vegetation provide homes for a few Arthropods. Antarctic wingless flies are sometimes thought of as the ‘largest animals’ that live year-round in Antarctica. 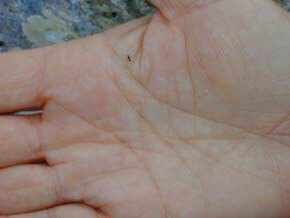 The Antarctic wingless fly is very small. A mite, a springtail, and a wingless fly are the only year-round animals in Antarctica. 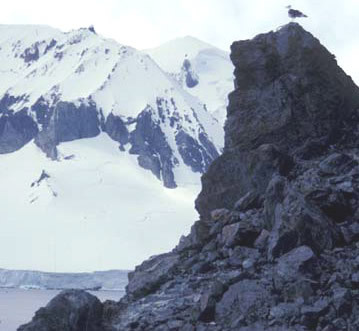 The wingless fly, or more specifically known as Belgica the flightless midge, can be seen during the Antarctic summer during a short period of time. 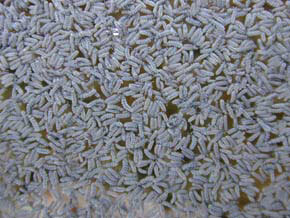 The springtails may be washed from nestling under rocks and in mosses by melting snow and end up floating in small pools of freshwater by the thousands. There are no forests or large terrestrial animals in Antarctica. 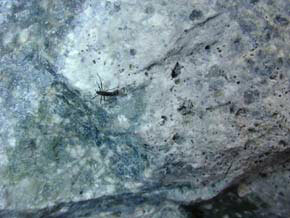 Antarctic springtails may form a black layer on small pools of melting ice as they are washed from the vegetation in which they live. It is only with close inspection that one sees they are life forms. Antarctic tidepools are scraped by ice every winter but a small number of organisms may live here temporarily during the summer thaw. Pink encrusting coralline algae and leafy red algae, along with leafy green algae are a few of the summer tidepool plants. During summer months a limited tidepool population of algae (leafy reds and greens as well as encrusting corallines), snails, limpets, and swimming crustaceans may be found on some of the ice-free tidepools along the shorelines of Antarctica. This area freezes each winter. However, if one goes below 30 feet deep there is a permanent subtidal community of sponges, starfish, and crustaceans that never encounters solid ice, and is very stable. This diverse subtidal community is a rich topic but will not be covered in this presentation.